c) those built between the two sieges of Rhodes (the second one occurred in 1522); they were state-of-the-art fortifications which could withstand the most powerful Ottoman cannon. Emporium, the commercial harbour, was protected by two towers: St Angel's Tower on its southern side was located at the end of a natural wharf; it was strengthened by Grand Master d'Aubusson who placed at its top the coat of arms of France: it is usually called Mills Tower because the wharf housed thirteen mills (only three are left); Naillac's Tower was built by Grand Master Philibert de Naillac before the development of cannon and it had the square shape of many medieval fortifications; it was badly damaged by two earthquakes during the XIXth century and it was eventually demolished because it could have fallen on the ships in the harbour: one can still see the bridge which led to the tower and the walls built around it by Grand Master d'Aubusson. Mandraki, the military harbour and most likely the harbour of the ancient town, was protected by a tower built in 1464-67 by Grand Master Raimondo Zacosta at the end of a natural wharf where other mills were located. The tower was turned into a small fortress by Grand Master d'Aubusson who built a bastion around it after the first siege of Rhodes. The Knights, after having conquered Rhodes in 1308, restored the existing Byzantine walls with just minor modifications: during the rule of Grand Masters Heredia (1377-96) and Naillac (1396-1421) the walls were almost entirely rebuilt and again modified and strengthened in the second half of the XVth century: the tower dedicated to St. Peter belongs to this period: it was built by Grand Master Zacosta in 1461-64 during the pontificate of Pope Pius II, whose coat of arms can be seen on the tower. In addition to building new fortifications the Grand Masters placed on the walls reliefs of angels guarding the town. After the 1480 siege of Rhodes the Order gained such fame that it received many donations which were used to substantially improve the town fortifications. St. George's Bastion was one of the most impressive additions: it was built with the assistance of Basilio della Scola, a military architect from Vicenza, a town near Venice. It had cannon batteries also at the ground level to hit the assailants at short range. "Early in the morning of September 24 1522, the Ottomans launched a simultaneous massive attack on the sectors of Spain, England, Provence and Italy. By mid-day the Janissaries had managed to take the Tower of Spain and plant their banners on the ramparts. It all seemed lost and the Grand Master himself rushed to the site with reinforcements. Finally, Fra Jacques de Bourbon with a few knights made their way through some underground passages and succeeded in recapturing the tower." 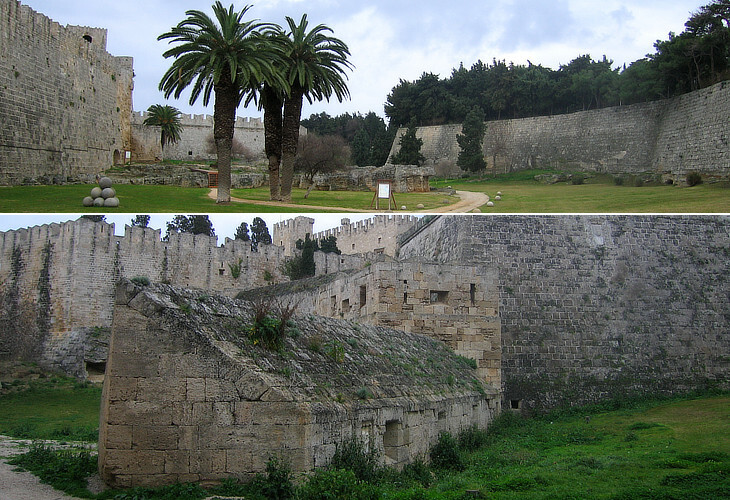 One of the most spectacular features of the fortifications of Rhodes is the very large moat surrounding the walls: to ensure the enemy could not easily fill it, the ground on the opposite side was contained by a massive wall, which was difficult to dismantle. In the moat itself the Knights built low casemates projecting from the walls from which cannon and guns could be fired. During the 1480 siege of Rhodes, the Ottomans managed to breach the walls in their south-eastern section: they then launched an assault which was fought with cold steel: three hundred janissaries (the élite Ottoman troops) managed to enter the town, but the knights led by Grand Master d'Aubusson and protected by their armour checked the bulk of the Ottoman army and eventually repelled the attackers. It was the final episode of the siege: the Ottoman losses were so high that the siege was lifted. Grand Master Fabrizio del Carretto gave his name to the huge round bastion which was built on the site of the breach. Another example of the fortifications built after the first siege is a long rampart in the middle of the moat: the knights could reach it via underground passages which could be blown up easily if the enemy managed to conquer the rampart. The development of such new fortifications led to a change in siege techniques: cannon did not throw explosive devices, but just heavy stones which had limited impact on the new bastions. The only way to significantly damage them was to place explosives at their base and so the Ottomans excavated tunnels for this purpose. Siege war became a matter for engineers. The image used as background for this page shows the coats of arms of the Order and of Grand Master d'Aubusson (northern stretch of the walls).